NOTE: This shower caddy may or may not fit in a corner of a tub, depending on size and shape of the tub. Please check dimensions (13.19″ L x 10.43″ W x 28.15″ H) before purchasing. Gone are the days of tripping over dropped shampoo bottles or losing your loofa. 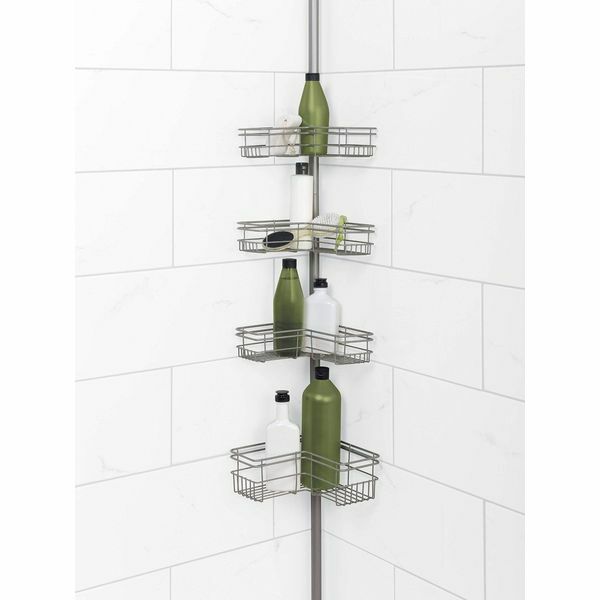 The Tenby Living 3 Shelf Shower Organizer Caddie includes spacers so that you can adjust it to size, and holes in its shelves allow for water to drain out, avoiding mold and mildew. Adjustable feet stabilize the corner shower caddie and you can have it assembled in mere minutes. 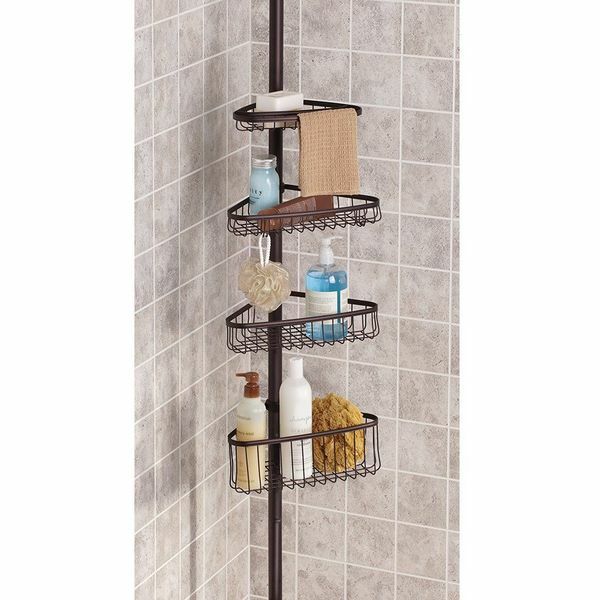 Get the most out of your small shower space when you add in the mDesign 3-Tier Free Standing Shower Shelf in Bronze. This 3-tiered storage unit is perfectly sized for shampoo bottles, lotions, and other toiletries. Its freestanding design allows it to be implemented inside or outside of the shower. It is made out of rust-resistant steel finished in a versatile bronze color. Slender, compact and able to fit ceilings up to 8’1” in height, the Zenna Home Bathtub and Shower Tension Corner Caddy in White is the ideal candidate for your next shower caddy. Its metal poles have been coated in enamel to stop rusting and chipping, while its plastic shelves are equally as rust proof and self-draining. Assembly instructions can previewed by clicking the link under Technical Specification below. With its clean lines and geometrically shaped shelves, the Zenna Home Tension Corner Pole Caddy in Satin Nickel is a nice modern addition to your shower. 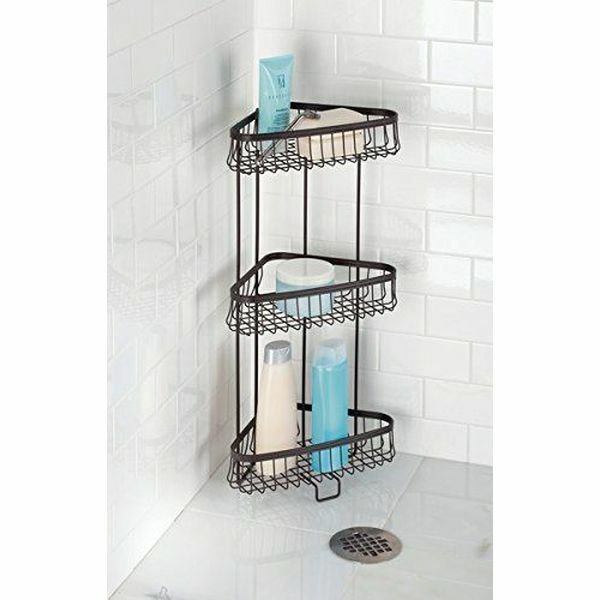 This rust-resistant shower caddy can fit any ceiling up to 8 feet, 1 inch, and features 4 self-draining baskets. A deeper basket is included for holding bigger items. Put the InterDesign York Tension Shower Caddy in Bronze into the corner of your shower and watch how much additional space you free up to move around in. This pole provides constant tension, no matter the length you have it set to. A rust-resistant finish and skid-free feet make this an efficient and economic caddy that can last you years to come. Corner shelf with polymer-grip pads stay in place on any surface-just position in desired corner and push the pressure handle to secure. 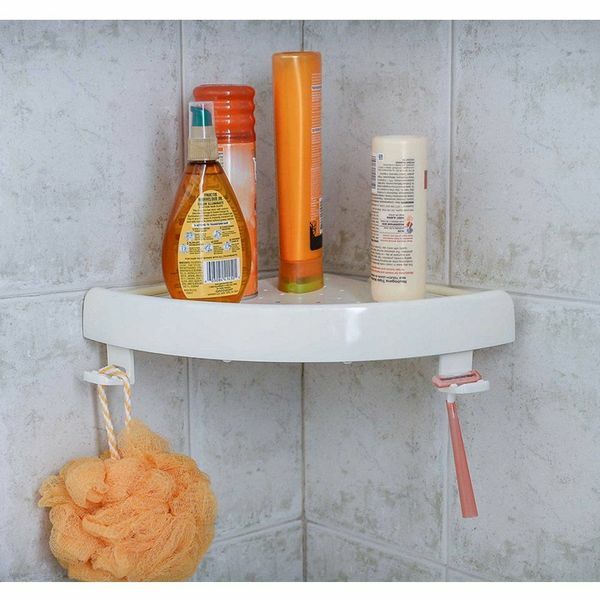 SnapUp Shelf includes cleverly designed holders and hooks to fit razors and washcloths. Easy to install and remove by pushing or pulling the handle – no tools required. Includes adjustable hooks for holding shampoo,soap and other common bath accessories. Made from high quality plastic material,Size:13″ x 8.25″ x 1.75″ Color:white. 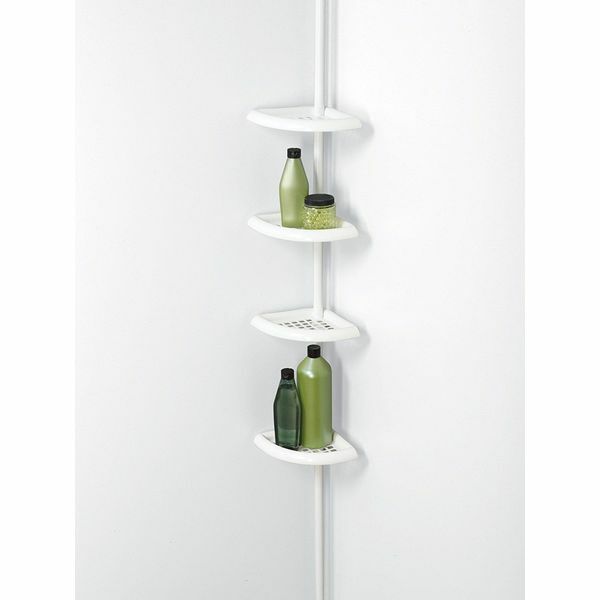 If you need instant storage for a few items in your shower, opt for the Bath and Shower Corner SnapUp Shelf in White. Installed in no time, this corner shelf features a polymer grip that allows it to stay in place, no matter what. It includes adjustable hooks for holding a variety of bathroom accessories, and is made from high quality plastic.